I love cards. I enjoy getting cards. I treasure sending cards. I even savor time spent in the card department at a store just looking at cards. DaySpring cards are some of my favorites. Their beauty just inspires names to come to mind of people I should send them to. Can you picture in your mind one or a few of the best cards that you have ever been given? One of my favorites cards is one I received this past Valentines Day from my husband. It is HUGE! It is literally a foot & a half high and a foot wide. I could describe it in detail or I could just show you. 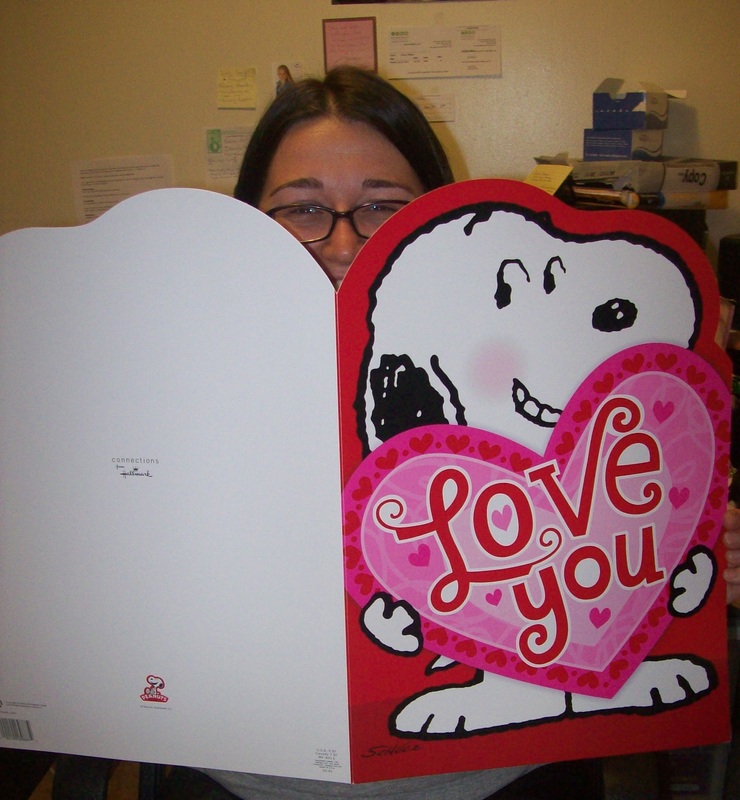 On the inside it reads “I finally found a valentine in proportion to my true feelings. Happy Valentine’s Day.” It also includes a heart warming personal message, but that’s not for me to share here. In fact, I have a whole box of cards that mean a lot to me. I call it my treasure box. In my box are cards from my Husband, they are a treasure because they are few and far between. 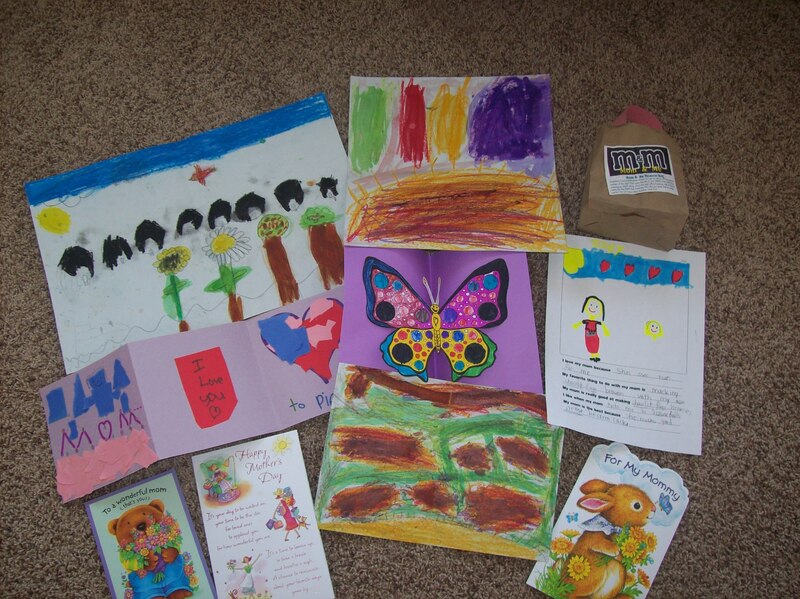 There are an assortment of cards from my kids in all shapes, sizes and kinds of construction paper. There are some from my brother, Mike, who has amazingly impeccable timing with his cards. I remember one time crying while looking through the mail and coming upon his card. It was such a precious gift. Then I have the friend cards. They contain some of the most encouraging words that have ever entered my heart. They, too, have come at miraculous times. Not only did these cards uplift the day that I received them, the have uplifted me at many other times when I was feeling so down. Those are the times that I go to my treasure box seeking hope. In fact, I got some good smiles out this morning looking through them again before writing this. Right next to my treasure box, I have my fun box. Now my fun box is filled with cards to write and send out to others. I call it my fun box because I have so much fun writing cards. I love the thought of sending a surprise through the mail or leaving it for someone to bring a little joy to their day. At times, my cards can be a random act of kindness. A name pops up in my head or my heart and I sit down to write them a card. Other times the cards I write are more of a planned act of kindness. Perhaps I know something is coming up for someone – an event that they could use a bit of encouragement for. Maybe it is that something happened and I know that they are in a recovery phase. Or maybe it’s just that I’ve been seeing an abundance of reminders about that person in my daily life. There are periods where I can just sit down and write the cards without stopping. It is an amazing blessing that I can start with a blank card, wondering how I could ever fill it up and end up writing in tiny font trying to get it all on the paper. Then there are times where I start & stop, start & stop, because I just can not get it written. There have even been a couple of occurrences where I woke up in the middle of the night with someone or something burning in my heart that I just had to get out before going back asleep. You must know the first few times this happened I really argued with God over it telling Him I could just as easily do it in the morning. I try now to be better about getting up and writing when called, but I am still human. I never ceased to be amazed at the responses I get to the cards I send. People say so much more than thank you. Some respond with tears because it touched them so or the timing was just right. I have even received thank you cards for a thank you card. I often hear that my cards are kept and reread many times over. I am just astonished to hear these things. Cards connect people in such an amazing way. Think, once again, about the cards you have received in your life. Which ones meant the most to you? When did they come? Who did they come from? What made them special? Cards and notes can really encourage people. I firmly believe that my mission in life is to encourage with love, passion and enthusiasm. I believe that passionate encouragement and prayer uplifts people and produces joy. That is what I try to center my life around, why I started PEP UP for Joy. Cards are such a huge part of my personal ministry. Yes, it is a small ministry. Each day I may only write a card or two. I try to blog twice a week. I do my best to send encouraging text messages, face book messages and emails when I can. It may be small, but I believe it brings glory to God and points people to Him. I also have found many passages in the Bible that talk about encouragement. I highlight the word encourage or encouragement in pink when I find it in my Bible. Here are a few of my favorite passages. Encourage one another. Do it daily. It will keep you soft and from becoming hard. It is a way to show love. It brings joy and refreshes hearts. So how do we live this out? Well one way is to sit down and write someone a card. I find it easiest to focus on just one at a time. If I come up with a couple of names, I tend to write them in my calendar on the next day or out a few days. One at a time has helped me to build a good habit. In fact, I can tell you there is one card sitting in my mailbox waiting to be swept away by the mailman. Who is coming to your mind and heart today? Who could use a little note of love and encouragement? Is it a spouse? Is it a child? How about a parent? What about your boss? An employee? A new friend? An old friend? A total stranger? Take the time, even if they do not respond. Who knows what it might mean to them? God does. He knows the full impact that it will have. Maybe when we get to Heaven He will show us what that one little card did as a part of His Story. Thank You so much for the ways that cards can connect us. Thank You for the encouragement they bring. Thank You for the love and joy that is found in both writing them and receiving them. That is truly amazing. Lord, please help us to be faithful in writing our cards to whomever You place upon our hearts. Help us to trust You for the words, especially when we are struggling or drawing a blank mind. Help us to trust that You have a plan for each of these cards because You are a God of details. In Your blessed name, Jesus’, we pray, amen. ← Thanks, God, for the work!